"IRS scandal" redirects here. For other scandals involving the IRS, see List of Internal Revenue Service political profiling controversies. In 2013, the United States Internal Revenue Service (IRS) revealed that it had selected political groups applying for tax-exempt status for intensive scrutiny based on their names or political themes. This led to wide condemnation of the agency and triggered several investigations, including a Federal Bureau of Investigation (FBI) criminal probe ordered by United States Attorney General Eric Holder. Initial reports described the selections as nearly exclusively of conservative groups with terms such as "Tea Party" in their names. According to Republican lawmakers, liberal-leaning groups and the Occupy movement had also triggered additional scrutiny, but at a lower rate than conservative groups. The Republican majority on the House Oversight Committee issued a report, which concluded that although some liberal groups were selected for additional review, the scrutiny that these groups received did not amount to targeting when compared to the greater scrutiny received by conservative groups. The report was criticized by the committee's Democratic minority, which said that the report ignored evidence that the IRS used keywords to identify both liberal and conservative groups. In January 2014, James Comey, who at the time was the FBI director, told Fox News that its investigation had found no evidence so far warranting the filing of federal criminal charges in connection with the controversy, as it had not found any evidence of "enemy hunting", and that the investigation continued. On October 23, 2015, the Justice Department declared that no criminal charges would be filed. On September 8, 2017, the Trump Justice Department declined to reopen the criminal investigation into Lois Lerner, a central figure in the controversy. In late September 2017, an exhaustive report by the Treasury Department's inspector general found that from 2004 to 2013, the IRS used both conservative and liberal keywords to choose targets for further scrutiny. United States federal tax law, specifically Section 501(c)(4) of the Internal Revenue Code (26 U.S.C. § 501(c)), exempts certain types of nonprofit organizations from having to pay federal income tax. The statutory language of IRC 501(c)(4) generally requires civic organizations described in that section to be "operated exclusively for the promotion of social welfare". Treasury regulations interpreting this statutory language apply a more relaxed standard, namely, that the organization "is operated primarily for the purpose of bringing about civic betterments and social improvements". As a result, the IRS traditionally has permitted organizations described in IRC 501(c)(4) to engage in lobbying and political campaign activities if those activities are not the organization's primary activity. Internal Revenue Service rules also protect groups organized under Section 501(c)(4) as nonprofit organizations dedicated to social welfare from having to reveal the names of their donors or the amount of funds the individual donors have contributed. This protection dates back to the United States Supreme Court's 1958 ruling in NAACP v. Alabama, when the Court held that disclosure of names could render private donors vulnerable to retaliation. Exterior of an Internal Revenue Service office. Nonprofit organizations dedicated to social welfare are not required to apply for IRS certification in order to operate under Section 501(c)(4) tax exemption rules. However, being certified by the IRS can help organizations attract more donations and provide some protection against further scrutiny. On January 21, 2010, the U.S. Supreme Court decided Citizens United v. Federal Election Commission, which overturned many previous restrictions on political campaign spending and allowed nearly unlimited and often anonymous spending by corporations and other groups to influence elections. Some Tea Party leaders began forming political action committees as offshoots of their 501(c)-tax-exempt organizations. By late September 2010, tax-exempt non-profit groups had spent in excess of $100 million on the mid-term elections, more than double the expenditure from a similar point in the election cycle four years earlier. They include 501(c)(4) "social welfare" organizations, like Crossroads, which has been the top spender on Senate races, and Americans for Prosperity, another pro-Republican group that has been the leader on the House side; 501(c)(5) labor unions, which have been supporting Democrats; and 501(c)(6) trade associations, like the United States Chamber of Commerce, which has been spending heavily in support of Republicans. Shortly thereafter, Senator Max Baucus, Democratic chair of the Senate Finance Committee, referring to The New York Times' and other media reports, asked the IRS to investigate to ensure that nonprofit organizations engaged in political activity were complying with IRS rules and not abusing their tax-exempt status. Republican senators on the finance committee Orrin Hatch and John Kyl responded to Baucus' request by writing to the IRS that they were worried this kind of investigation would violate First Amendment rights, and they asked that a Treasury Department inspector general conduct a review of any such investigation to ensure its impartiality. Senate and House Democrats in early 2012 continued to press the IRS to investigate abuses of 501(c)(4) tax-exempt status by organizations engaged in political activity. In a February 2012 letter to then-IRS Commissioner Douglas Shulman, several Democratic senators led by Senator Chuck Schumer wrote, "We urge you to protect legitimate section 501(c)(4) entities by preventing non-conforming organizations that are focused on federal election activities from abusing the tax code." The senators also urged the IRS to issue new rules to prevent this type of abuse. In a follow-up letter sent in March 2012, the senators asked the IRS to clearly define the amount of political activity that is permissible for "social welfare" groups under 501(c)(4) rules, to require the groups to document in their IRS filings the exact percentage of their activity that is dedicated to "social welfare", and to require the groups to notify their donors of what percentage of donations could be claimed for tax deductions. The senators promised to introduce legislation to accomplish these aims if the IRS did not do so itself by promptly issuing new administrative rules. None of these letters called for the targeting of groups on the basis of political ideology. Between 2010 and 2012, the number of applications the IRS received each year seeking 501(c)(4) certification doubled. During this period, budget cuts and personnel cuts reduced the IRS's ability to adequately perform its core duties. When the Obama administration requested in 2011 that Congress increase the IRS's $12.1 billion budget by $1 billion to allow the agency to hire 5,100 additional agents, Congress instead reduced the IRS budget to $11.8 billion, and the IRS offered buyouts to 5,400 of its 95,000 employees. The U.S. National Taxpayer Advocate, Nina E. Olson, told The New York Times in January 2012, "The overriding challenge facing the I.R.S. is that its workload has grown significantly in recent years, while its funding is being cut.... This is causing the I.R.S. to resort to shortcuts that undermine fundamental taxpayer rights and harm taxpayers—and at the same time reduces the I.R.S. 's ability to deliver on its core mission of raising revenue." Beginning in March 2010, the IRS more closely scrutinized certain organizations applying for tax-exempt status under sections 501(c)(3) and 501(c)(4) of the Internal Revenue Code by focusing on groups with certain words in their names. In May 2010, some employees of the "Determinations Unit" of the Cincinnati office of the IRS, which is tasked with reviewing applications pertaining to tax-exempt status, began developing a spreadsheet that became known as the "Be On the Look Out" ("BOLO") list. Over the two years between April 2010 and April 2012, the IRS essentially placed on hold the processing of applications for 501(c)(4) tax-exemption status received from organizations with "Tea Party", "patriots", or "9/12" in their names. While apparently none of these organizations' applications were denied during this period,[Note 2] only 4 were approved. During the same general period, the agency approved applications from several dozen presumably liberal-leaning organizations whose names included terms such as "progressive", "progress", "liberal", or "equality". However, the IRS also selected several progressive- or Democratic-leaning organizations for increased scrutiny. An affiliate of the liberal group Emerge America had its request for tax-exempt status denied, leading to a review (and the eventual revocation) of the larger Emerge America organization's tax-exempt status. The conservative National Review states that a November 2010 version of the IRS's BOLO list indicates that liberal and conservative groups were in fact treated differently because liberal groups could be approved for tax-exempt status by line agents, while tea party groups could not. Ryan Chittum of the Columbia Journalism Review reported in 2011 that a number of non-profit news organizations saw their applications delayed for years after being flagged for additional review. In 2013, Chittum linked that scrutiny to the investigation, reporting that non-profit news organizations and Tea Party groups were placed in the same "Emerging Issues" category by IRS reviewers, which was a category flagged for additional questioning. He stated that "Rather than the Nixonian conspiracy that George Will and The Wall Street Journal editorial page so darkly warned about—with zero evidence—you have a routine bureaucratic procedure meant to bundle potentially problematic applicants together for further review." An investigation by The New York Times reported that several organizations selected for scrutiny by the IRS engaged in activities that could be construed as political. The Ohio Liberty Coalition, whose application was delayed in excess of two years, sent emails to their members regarding Mitt Romney presidential campaign events and handed out Romney "door hangers" while canvassing neighborhoods. Former IRS officials and tax experts say this type of behavior would provide a "legitimate basis" for additional scrutiny. Ohio State University law professor Donald Tobin said: "While some of the I.R.S. questions may have been overbroad, you can look at some of these groups and understand why these questions were being asked." Some flagged organizations were required to provide further documentation in requests that Rep. Bill Flores called "overreaching and impossible to comply with". Documentation requested varied among different groups but, in some cases, included copies of "any contracts" or "training material" the groups may have exchanged with Koch foundations. In one instance, the IRS asked for "summaries or copies of all material passed out at meetings." Several letters asked for "copies of the groups' Web pages, blog posts and social media postings." Organizations were informed that if they did not provide the information sought, they would not be certified as tax-exempt. Provide the following information for the income you received and raised for the years from inception to the present. Also, provide the same information for the income you expect to receive and raise for 2012, 2013, and 2014. The names of the donors, contributors, and grantors. If the donor, contributor, or grantor has run or will run for a public office, identify the office. If not, please confirm by answering this question "No". How did you use these donations, contributions, and grants? Provide the details. If you did not receive or do not expect to receive any donation, contribution, and grant income, please confirm by answering "None received" and/or "None expected". Another unidentified applicant was asked to "Please provide copies of all your current web pages, including your Blog posts. Please provide copies of all of your newsletters, bulletins, flyers, newsletters or any other media or literature you have disseminated to your members or others. Please provide copies of stories and articles that have been published about you." In November 2013, the investigative reporting organization ProPublica requested information from the IRS on 67 nonprofit groups that had spent money on the 2012 elections, including Karl Rove's Crossroads GPS. The IRS's Cincinnati office responded with the documents from 31 of the groups. Of the 31 groups, nine were confidential applications of conservative groups that had not yet been approved and therefore were not supposed to be publicly disclosed. ProPublica made six of these applications public, "after redacting their financial information, deeming that they were newsworthy." ProPublica had made a records request to the office seeking only completed applications, which are public information. In 2011, audit letters were sent to five donors to a now-defunct conservative 501(c)(4) group, Freedom's Watch, which were involved in the 2008 election cycle. The goal of the audit was to assess whether or not gift taxes needed to be paid on these donors' donations to Freedom's Watch. The Congressional Research Service said that the audit was legally well-founded, as tax law exempts only 501(c)(3) and 527 groups from gift taxes. However, Ari Fleischer, a board member of the group, alleged that the group was being singled out. According to tax experts, the IRS had not been enforcing that law, but tax lawyers had advised their clients that they might owe the tax, leading to a situation where some paid and some did not. The audit appeared to indicate a new emphasis on enforcing the law, but political opposition from Republicans in Congress led to the IRS dropping the audit and publicly announcing that it would not levy gift taxes on contributions to 501(c)(4) groups. Inspector General J. Russell George's report recommended that the IRS create clearer rules and conduct more training for employees on 501(c)(4) issues, including gift tax exemptions. In early May 2013, the Treasury Inspector General for Tax Administration released an audit report confirming that the IRS used inappropriate criteria to identify potential political cases, including organizations with Tea Party in their names. On May 10, in advance of the public release of the audit findings, Director of the IRS Exempt Organizations division Lois Lerner answered what was later revealed to be a planted question by stating that the IRS was "apologetic" for what she termed "absolutely inappropriate" actions. (Lerner's superior, then-Acting IRS Commissioner Steven Miller, later testified to Congress that he had discussed with Lerner how she was to make the revelation and apology using a planted question at a meeting of the American Bar Association rather than during an appearance two days earlier before the House Ways & Means Committee in Congress.) She asserted that the extra scrutiny had not been centrally planned and had been done by lower-level "front line people" in the Cincinnati office. Media reports soon revealed that IRS officials in two other regional offices had also been involved in scrutinizing conservative groups and that selected applicants said that they had been told their applications were being overseen by a task force in Washington, D.C. The Treasury Inspector General for Tax Administration report showed that Lerner herself had been informed of the affair at a meeting that she had attended on June 29, 2011. On May 12, Republican and Democratic lawmakers called for a full investigation of the Internal Revenue Service, while White House Press Secretary Jay Carney called the IRS's alleged actions "inappropriate". On May 13, The Washington Post reported that Marcus Owens, head of the IRS department examining tax-exempt groups in 1990–1999, said that the IRS routinely categorized similar groups that sought the status of social welfare organizations. At a May 13 press conference, President Obama called the charges "outrageous" if true, and said that anyone found to be responsible for such actions should be held accountable. On May 14, the Inspector General's audit report was made public. President Obama released a statement saying, "The IRS must apply the law in a fair and impartial way, and its employees must act with utmost integrity. This report shows that some of its employees failed that test. I've directed Secretary Lew to hold those responsible for these failures accountable, and to make sure that each of the Inspector General's recommendations are implemented quickly, so that such conduct never happens again. But regardless of how this conduct was allowed to take place, the bottom line is, it was wrong." Attorney General Eric Holder announced that he had ordered the Justice Department to begin an investigation into whether the activities amounted to criminal behavior. The IRS used inappropriate criteria that identified for review Tea Party and other organizations applying for tax-exempt status based upon their names or policy positions instead of indications of potential political campaign intervention. Ineffective management: 1) allowed inappropriate criteria to be developed and stay in place for more than 18 months, 2) resulted in substantial delays in processing certain applications, and 3) allowed unnecessary information requests to be issued. Although the processing of some applications with potential significant political campaign intervention was started soon after receipt, no work was completed on the majority of these applications for 13 months.... For the 296 total political campaign intervention applications [reviewed in the audit] as of December 17, 2012, 108 had been approved, 28 were withdrawn by the applicant, none had been denied, and 160 were open from 206 to 1,138 calendar days (some for more than three years and crossing two election cycles).... Many organizations received requests for additional information from the IRS that included unnecessary, burdensome questions (e.g., lists of past and future donors). The Inspector General concluded, "although the IRS has taken some action, it will need to do more so that the public has reasonable assurance that applications are processed without unreasonable delay in a fair and impartial manner in the future." The Washington Post described the audit report as having found that some IRS employees were "ignorant about tax laws, defiant of their supervisors and blind to the appearance of impropriety". J. Russell George, the Treasury Department Inspector General who had alerted lawmakers to the IRS's improper behavior, was criticized by Republican lawmakers, who said that because inspectors general are required to notify Congress via agency heads when wrongdoing is discovered—and in serious cases must do so within 7 days—he should have notified Congress in 2012, prior to the election that year. Inspector General George, who was appointed by President George W. Bush, responded by saying that the audit had not been complete, and that in his view, "to ensure fairness and to ensure that we are completely accurate with the information that we convey to Congress, we will not report information until the IRS has had an opportunity to take a look at it to ensure that we're not misstating facts." On June 24, 2013, new IRS commissioner Danny Werfel revealed that an internal investigation had discovered that the inappropriate screening was both broader and longer-lasting than had previously been known. The report found that words such as "Israel", "progressive" and "Occupy" were also used as red-flags for greater scrutiny, and that screeners were still using such lists up until May 2013. A spokesman for the Inspector General's office in charge of the IRS audit said they had been asked by House Oversight Chairman Darrell Issa (R-CA) "to narrowly focus on Tea Party organizations". On June 27, 2013, responding to letters from Rep. Sander Levin, the ranking member on the Ways and Means Committee, Inspector General J. Russell George's office released a letter to Levin about the scrutiny of groups with "progressive" in their names. Contradicting earlier claims of George's office, the letter acknowledged that he knew that the word "progressive" had appeared in IRS screening documents. However, he said that the "Progressives" criteria was on a part of the "Be On the Look Out" (BOLO) spreadsheet labeled "Historical", and, unlike other BOLO entries, did not say how to refer flagged cases. While he had many sources confirming the use of "Tea Party" and related criteria described in the report, including employee interviews and e-mails, he found no indication in any of those other materials that "Progressives" was a term used to refer cases for scrutiny for political campaign intervention. The letter further stated that out of the 20 groups applying for tax-exempt status whose names contained "progress" or "progressive", 6 had been chosen for more scrutiny as compared to all of the 292 groups applying for tax-exempt status whose names contained "tea party", "patriot", or "9/12". In late September 2017, an exhaustive report by the Treasury Department's inspector general found that from 2004 to 2013, the IRS used both conservative and liberal keywords to choose targets for further scrutiny, blunting claims that the issue had been an Obama-era partisan scandal. The 115 page report confirmed the findings of the prior 2013 report that some conservative organizations had been unfairly targeted, but also found that the pattern of misconduct had been ongoing since 2004 and was non-partisan in nature. In reaction, Democratic Senator Ron Wyden of Oregon, the ranking Democrat on the Senate Finance Committee, stated “After years of baseless claims and false accusations it is my hope Republicans will finally put an end to this witch hunt and admit that their attacks on the I.R.S. were nothing but political grandstanding on behalf of special interests at the expense of American taxpayers." In contrast, the Republican chairman of the House Ways and Means Committee, Kevin Brady of Texas, responded by saying that "this report reinforces what government watchdogs and congressional investigators have confirmed time and time again: Bureaucrats at the I.R.S., such as Lois Lerner, arbitrarily and haphazardly administered the tax code and targeted taxpayers based on political ideology.” Regardless of reaction, the release of the report brought to an end the last formal governmental investigation into the IRS practice. TEA Party members across the U.S. demonstrated at IRS offices on May 21, 2013. Protesters at IRS facility in Mountainside, New Jersey on May 21, 2013. Montana's then-senator Max Baucus said the allegations were an "outrageous abuse of power," and West Virginia senator Joe Manchin called the IRS's actions "un-American." From May 13 to 15, several senators and congressional representatives called for Acting Commissioner of the IRS, Steven T. Miller, to resign or be fired. The Speaker of the House of Representatives, John Boehner, said, "My question isn't about who's going to resign, my question is who's going to jail over this scandal?... There are laws in place to prevent this type of abuse. Someone made a conscious decision to harass and to hold up these requests for tax-exempt status. I think we need to know who they are and whether they violated the law. Clearly someone violated the law." Later in the day on May 15, 2013, President Obama announced that his Treasury Secretary had requested and accepted Acting Commissioner Miller's resignation. Lawmakers also called for the resignation of Lois Lerner, who ran the IRS's section on tax-exempt organizations, as did Danny Werfel, after he was appointed Acting IRS Commissioner following Miller's resignation. When Lerner refused to resign, she was placed on administrative leave. Lerner retired effective September 23, 2013. Michael Macleod-Ball, chief of staff at the ACLU's Washington Legislative Office, said, "Even the appearance of playing partisan politics with the tax code is about as constitutionally troubling as it gets. With the recent push to grant federal agencies broad new powers to mandate donor disclosure for advocacy groups on both the left and the right, there must be clear checks in place to prevent this from ever happening again." U.S. Senator Claire McCaskill (D-MO) said, "We should not only fire the head of the IRS, which has occurred, but we've got to go down the line and find every single person who had anything to do with this and make sure that they are removed from the IRS and the word goes out that this is unacceptable." 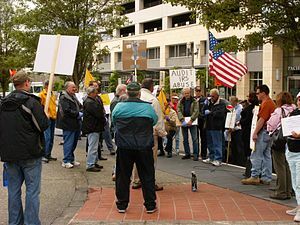 There were rallies by members of the Tea Party in Cherry Hill, New Jersey, as well as across the country protesting selective targeting by the IRS of conservative groups seeking tax-exempt status. U.S. Senator John Cornyn of Texas released a video titled "A Culture of Intimidation" and a website called "IRS targeting Texans" with multiple stories from conservatives in Texas and elsewhere who had received intrusive questions from the IRS. Press reaction to the IRS's actions was intense. MSNBC's Rachel Maddow said: "There is a reasonable fear by all of us, by any of us, that the kind of power the IRS has could be misused," she further said that this scrutiny of Tea Party groups was "not fair." Comedy Central's Jon Stewart stated that the controversy had taken "the last arrow in your pro-governance quiver," he further said that this threw doubt on President Obama's "managerial competence" and had proven correct "conspiracy theorists," moving the burden of proof onto federal authorities. ABC News' Terry Moran wrote that this was: "A truly Nixonian abuse of power by the Obama administration." NBC's Tom Brokaw stated: "It's time for action." NBC's White House correspondent Chuck Todd: "It didn’t seem like they had a sense of urgency about it, a real sense of outrage," and further; "This is outrageous no matter what political party you are." MSNBC's Joe Scarborough said: "This is tyranny," and talked of "unspeakable" abuses by the IRS. "This time it's real." A poll released by Quinnipiac University on May 30 revealed that 76% of registered voters—including 63% of Democrats—favored the appointment of a special prosecutor to independently investigate the allegations of wrongdoing. Pollster Peter A. Brown said there was "overwhelming bipartisan support" for such an investigation. An NBC News/Wall Street Journal poll conducted May 30 to June 2, 2013, found that 55% of respondents believed that the controversy raises questions about the Obama administration's honesty and integrity. This poll found 33% of respondents blamed Obama directly for the actions underlying the controversy. The poll also found the public's confidence in the IRS to be low, with just 10% of respondents expressing confidence in the agency. While conservatives and Republican politicians have generally continued to view the IRS's conduct as indicative of politically motivated targeting, many liberal commentators and Democratic politicians quickly came to believe that while the conduct was improper, it was not motivated by politics. Consequently, liberal reactions to the controversy have shifted considerably from the initial condemnation and calls for investigation to descriptions of the controversy as the "Vanishing I.R.S. Scandal," and suggestions that subsequent revelations represent a "nail in the [controversy's] coffin"  and the controversy's "fizzl[ing]". On June 9, 2013, less than a month after the initial revelation, House Oversight Committee ranking member Elijah Cummings (D-MD) stated: "Based upon everything I've seen, the case is solved. And if it were me, I would wrap this case up and move on." Following an investigation by the Senate Finance Committee, ranking member Ron Wyden stated: "You are not going to find a partisan political scandal or proof of life on Pluto." Lois Lerner, the Internal Revenue Service official at the center of the controversy, retired effective September 23, 2013. Catherine Engelbrecht, founder of conservative group True the Vote, filed a lawsuit claiming that her organization's tax-exempt status was unfairly delayed for three years, and alleging that she and her family's small manufacturing business were chosen for retaliatory investigations by the IRS, OSHA, the ATF, and the FBI. In 2013, Chris Van Hollen filed a lawsuit against the IRS to stop the tradition of allowing groups engaged in politics to be registered under 501(c)(4). In October 2013, the National Organization for Marriage (NOM) filed a federal lawsuit, alleging that the IRS intentionally leaked its 2008 tax return, including donor lists, in violation of federal law. The lawsuit arose from the March 2012 disclosure of NOM's tax return information, including its 2008 IRS Form 990, Schedule B, which contains donor data, to the Human Rights Campaign, an LGBT rights advocacy group, and to the media. (The disclosure revealed that Romney had given $10,000 to NOM, an anti-gay marriage group). Under U.S. federal law, "the IRS is required to provide the public with certain tax information for 501(c)(4) organizations upon request—but personal identifying information of donors must be redacted by the agency." In a June 2014 ruling, Judge James Cacheris of the U.S. District Court for the Eastern District of Virginia dismissed most of NOM's claims. While the IRS acknowledged that it had improperly made an unredacted copy of NOM's tax information public, NOM provided "no evidence that the information was willfully disclosed or the result of gross negligence." In June 2014, the IRS reached a settlement over NOM's remaining claims of improper disclosure of confidential tax information, in which the IRS agreed to pay $50,000 to NOM. In October 2017, the Trump Justice Department settled two lawsuits filed by conservative groups that said they were targeted in the controversy. One of these lawsuits was filed on behalf of 428 groups, and the other was filed on behalf of 41 groups. The settlement included payments of $3.5 million to these groups, an apology, and an admission of wrongdoing from the IRS. At least as early as mid-2011, higher-ranking IRS officials knew that conservative groups were being scrutinized. Selected groups complained to various members of Congress. In response, a congressional committee asked IRS Commissioner Douglas H. Shulman about the allegations in 2012. Shulman told the committee that the agency was not targeting conservative groups. After Shulman denied that the IRS was unfairly targeting conservative groups, the congressional committee ended the 2012 phase of the investigation. Shulman resigned his post in late 2012, before the controversy came to light. Following the Inspector General's report, the House Committee on Oversight and Government Reform began an investigation into the IRS. Additionally, the House Committee on Ways and Means expanded its ongoing 2011 investigation into possible IRS political targeting to include the BOLO ("be on the lookout") keyword targeting allegations. On May 15, 2013, the House Oversight Committee requested that Holly Paz, John Shafer, Gary Muther, Liz Hofacre and Joseph Herraz be interviewed beginning May 20, 2013. On May 22, 2013, in her opening statement to the Oversight Committee, Lois Lerner stated: "I have not broken any laws. I have not violated any IRS rules or regulations. And I have not provided false information to this or any other congressional committee." Lerner then invoked her Fifth Amendment right against self-incrimination and refused to testify. Oversight Committee Chairman Darrell Issa later asserted that Lerner had waived her Fifth Amendment rights by giving partial testimony and that he intended to call her back into the hearings. Congressman Trey Gowdy agreed with Issa. Gowdy stated: "She [Lois Lerner] just waived her Fifth Amendment right. You don't get to tell your side of the story and then not be subjected to cross examination—that's not the way it works. She waived her right to Fifth Amendment privilege by issuing an opening statement. She ought to stand here and answer our questions." Regent University law professor James Duane told New York magazine that Gowdy's assertion was "extremely imaginative" but "mistaken" because a person who is involuntarily summoned before a grand jury or a legislative body may selectively invoke the right to silence. Harvard Law School professor Alan Dershowitz took a different view, arguing: "You can't simply make statements about a subject and then plead the Fifth in response to questions about the very same subject," and asserting, "[o]nce you open the door to an area of inquiry, you have waived your Fifth Amendment right." On May 22, 2013, former IRS Commissioner Doug Shulman testified that he had frequently visited the White House during 2010–2011, but he denied having discussed the targeting of conservatives with anyone in the White House. His testimony was criticized by several columnists. Some media outlets and lawmakers asserted that Shulman had visited the White House up to 157 times; however, The Atlantic reported that that represented the number of times Shulman was cleared by the Secret Service to visit the White House or the Eisenhower Executive Office Building, not necessarily the number of times Shulman actually arrived; visitor sign-in logs can confirm only 11 visits between 2009 and 2012, though the number is likely higher because the sign-in system does not capture every visitor, particularly at large events. Shulman was regularly scheduled for events like the biweekly health-care deputies meeting that would have had a standing list of people cleared to attend. On June 9, 2013, Rep. Cummings released portions of an interview transcript in which an anonymous IRS manager who described himself as a "conservative Republican" told Congressional investigators that he had initiated the selected reviews without any involvement from the White House and that the extra scrutiny was not politically motivated. In an appearance on CNN's State of the Union, Cummings said, "Based upon everything I've seen, the case is solved. And if it were me, I would wrap this case up and move on." Oversight Committee Chairman Issa responded in a statement, "The testimony excerpts Ranking Member Cummings revealed today did not provide anything enlightening or contradict other witness accounts. The only thing Ranking Member Cummings left clear in his comments today is that if it were up to him the investigation would be closed." On May 7, 2014, on a near party-line vote (with six Democrats joining all Republicans) the House of Representatives voted to hold Lerner in contempt of Congress for refusing to cooperate with the Congressional investigation. House Republicans dismissed Lerner's invocation of the Fifth Amendment as ineffective, with Issa stating: "You don’t get to use a public hearing to tell the public and press your side of the story and then invoke the Fifth." Democrats characterized the contempt proceeding as a "witch hunt" geared toward the 2014 midterm elections. On June 13, 2014, the IRS notified Republican congressional investigators that it had lost Lerner's emails from January 2009 to April 2011 because of a mid-2011 computer crash. The emails were under subpoena as part of the congressional investigation. On June 19, the IRS said that the damaged hard drive containing Lerner's missing emails had been disposed of more than two years prior. Some commentators have raised legal issues concerning how the IRS handled these federal records. A National Archives and Records Administration spokesperson said in an email communication that: "The Office of the Chief Records Officer for the U.S. Government has contacted the IRS to explore specifics of the situation." On July 9, 2014, Republicans released an April 13, 2013 email from Lerner in which she cautioned colleagues to "be cautious about what we say in emails," citing congressional inquiries. The email did not specify which congressional inquiries Lerner was concerned about and made no mention of the then-impending TIGTA report. Republicans said that this email suggested that Lerner tried to hide evidence from investigators. On September 5, 2014, the IRS said it lost additional emails of five workers under congressional investigation, blaming computer crashes. These five workers include two people based in Cincinnati who worked on Tea Party cases; according to the IRS the crashes all predate congressional investigations and had occurred between September 2009 and February 2014. On September 5, 2014, the Senate Permanent Subcommittee on Investigations released its report on the controversy. The subcommittee's majority report, authored by subcommittee chairman Senator Carl Levin and submitted for the subcommittee's Democrats, concurred with TIGTA's finding that inappropriate screening criteria were used but concluded that there was no intentional wrongdoing or political bias in the use of the criteria. The majority faulted TIGTA for omitting from its report that liberal groups were also selected for additional screening and that previous TIGTA inquiries found no indication of political bias at the IRS. The subcommittee's Republican minority submitted a dissenting report authored by ranking member Senator John McCain which broadly validated the TIGTA report and accused the majority of minimizing bias against conservative groups, noting that most of the groups targeted for additional scrutiny were conservative. On November 22, 2014, a spokesman for the House Oversight and Government Reform Committee's Republican majority stated that TIGTA investigators told Congress that they had recovered up to 30,000 emails to and from Lois Lerner. On December 23, 2014, Chairman Issa's staff released a new report that found that "[t]he IRS's inability to keep politics out of objective decisions about interpretation of the tax code damaged its primary function: an apolitical tax collector that Americans can trust to treat them fairly." The report was criticized by Rep. Cummings as "cherry-picked" to support a political narrative. The report did not link the IRS's conduct to coordination with the White House, though Republicans stressed that the investigation is ongoing and will continue in the next Congress. In January 2015, the United States Senate requested that the White House produce all communications it has had with the IRS since 2010. On August 5, 2015, the Senate Finance Committee released Senate Report 114-119, The Internal Revenue Service's Processing of 501(c)(3) and 501(c)(4) Applications for Tax-Exempt Status Submitted by "Political Advocacy" Organizations From 2010-2013. The Report runs 7,913 pages, and includes a 142-page "Bipartisan Investigative Report as Submitted by Chairman Hatch and Ranking Member Wyden." The Committee concluded that management at the IRS had been "delinquent in its responsibility to provide effective control, guidance, and direction over the processing of applications for tax-exempt status filed by Tea Party and other political advocacy organizations" and that poor planning by the agency resulted in "predictable failure" in addressing those delinquencies. The Committee found that "IRS managers forfeited the opportunity to shape the IRS's response to the influx of political advocacy applications by simply failing to read reports informing them of the existence of those applications." While the report contained many bipartisan findings, Republican and Democratic committee members offered separate reports differing sharply on the ultimate reason for the IRS's failures. The Republican report (entitled "Additional View of Senator Hatch Prepared by Republican Staff") stated that the IRS had targeted Tea Party groups for "politically motivated reasons," while the Democratic report (entitled "Additional View of Senator Wyden Prepared by Democratic Staff") blamed the agency's failures on "gross mismanagement" that treated groups in the same poor manner regardless of ideology. In January 2014, the Federal Bureau of Investigation (FBI) announced that it had found no evidence warranting the filing of federal criminal charges in connection with the affair. The FBI stated it found no evidence of "enemy hunting" of the kind that had been suspected, but that the investigation did reveal the IRS to be a mismanaged bureaucracy enforcing rules that IRS personnel did not fully understand. The officials indicated, however, that the investigation is continuing. In October 2015, the Justice Department notified Congress that there would be no charges against the former IRS official Lois Lerner or against anyone else in the IRS. The investigation found no evidence of illegal activity or the partisan targeting of political groups and found that no IRS official attempted to obstruct justice. The DOJ investigation did find evidence of mismanagement and Lerner's poor judgement in using her IRS account for personal messages but said "...poor management is not a crime." In September 2017, the DOJ declined a request from the U.S. House Committee on Ways and Means to reopen the investigation into Lerner's IRS activities. Four days after the Justice Department closed its investigation, 19 members of the House Oversight and Government Reform Committee led by the Committee's Chairman, Jason Chaffetz (R-UT), filed a resolution to impeach IRS Commissioner John Koskinen. Those sponsoring the impeachment resolution to remove Koskinen from office accused him of failing to prevent the destruction of evidence in allowing the erasure of back-up tapes containing thousands of e-mails written by Lois Lerner, and of making false statements under oath to Congress. In a statement released by the Committee, Chaffetz said Koskinen "failed to comply with a congressionally issued subpoena, documents were destroyed on his watch, and the public was consistently misled. Impeachment is the appropriate tool to restore public confidence in the IRS and to protect the institutional interests of Congress." On October 27, 2015, the IRS stated that the agency did not have an immediate comment on the impeachment resolution. Representative Cummings said in a statement: "This ridiculous resolution will demonstrate nothing but the Republican obsession with diving into investigative rabbit holes that waste tens of millions of taxpayer dollars while having absolutely no positive impact on a single American. Calling this resolution a 'stunt' or a 'joke' would be insulting to stunts and jokes." Responding to a lawsuit filed by Judicial Watch, Thomas Kane, Deputy Assistant Chief Counsel for the IRS, wrote in a sworn declaration that Lerner's Blackberry was "removed or wiped clean of any sensitive or proprietary information and removed as scrap for disposal in June 2012." In a USA Today opinion column, James S. Robbins wrote, "For a scandal that is frequently derided as 'fake,' it is amazing how often real evidence disappears. The disappearing act is so frequent, it is reasonable to wonder whether it is really a systematic attempt to destroy evidence of abuse of power." An IRS IT official told the National Review that any personal folders containing Lerner's emails were unlikely to have been on the Blackberry as, if they had been, then IT employees "wouldn’t have been jumping through all the hoops to recover data from [Lerner's crashed hard] drive" in June 2011. ^ Although Crossroads GPS is organized as a self-declared 501(c)(4) organization, its application reportedly had not yet been approved by mid-May 2013 when the Treasury Department Inspector General for Tax audit report was released, and Organizing for Action had not applied for IRS tax-exempt certification. ^ The Treasury Inspector General for Tax Administration's audit found (page 14): "For the 296 potential political cases we reviewed, as of December 17, 2012, 108 applications had been approved, 28 were withdrawn by the applicant, none had been denied, and 160 cases were open from 206 to 1,138 calendar days (some crossing two election cycles)." Bloomberg News reported on May 14, 2013, "None of the Republican groups have said their applications were rejected." ^ Ohlemacher, Stephen (September 8, 2017). "Trump DOJ declines to charge Lois Lerner, a key figure in IRS scandal". Chicago Tribune. Retrieved October 30, 2017. ^ a b c Rappeport, Alan (October 5, 2017). "In Targeting Political Groups, I.R.S. Crossed Party Lines". The New York Times. ISSN 0362-4331. Retrieved March 25, 2018. ^ Cochrane, Emily (October 26, 2017). "Justice Department Settles With Tea Part Groups After I.R.S. Scrutiny". New York Times. Retrieved October 26, 2017. ^ Overby, Peter (October 27, 2017). "IRS Apologizes For Aggressive Scrutiny Of Conservative Groups". NPR. Retrieved December 30, 2018. ^ "IRS To Look At Political Activity of Section 501(c)(4) Organizations". ^ Eilperin, Juliet (May 14, 2013). "The real reason outside groups want tax-exempt status". The Washington Post. ^ Bykowicz, Julie (July 23, 2013). "IRS says it will examine rules for nonprofit political activity". Bloomberg L.P.
^ Schwartz, Emma (October 30, 2012). "The rules that govern 501(c)(4)s". PBS Frontline. ^ a b c d e f g h i Treasury Inspector General for Tax Administration Michael McKenney, Acting Deputy Inspector General for Audit (May 14, 2013). "Inappropriate Criteria Were Used to Identify Tax-Exempt Applications for Review" (PDF). Department of the Treasury. Retrieved May 22, 2013. ^ Gold, Matea; Parsons, Christi (May 20, 2013). "Congress expands inquiry into IRS handling of conservative groups". Los Angeles Times. ^ a b "IRS Office That Targeted Tea Party Also Disclosed Confidential Docs From Conservative Groups". ProPublica. November 15, 2012. Retrieved May 14, 2013. ^ Gold, Matea (January 17, 2013). "Seeking to harness Obama's campaign resources for a second term". Los Angeles Times. ^ "What is a 501(c)(4), anyway?". The Washington Post. ^ Gold, Matea (May 20, 2013). "Crossroads GPS believes it is under IRS scrutiny". Los Angeles Times. ^ Metzler, Rebekah (May 15, 2013). "Organizing for Action, Obama's group, has yet to apply to IRS". US News & World Report. ^ Barker, Kim (August 24, 2012). "How nonprofits spend millions on elections and call it public welfare". ProPublica. ^ Associated Press (June 25, 2012). "Supreme Court strikes down law limiting corporate campaign spending; Citizens United Case reverses 1912 law". Daily News. New York. ^ a b c McIntire, Mike (September 23, 2010). "Hidden under tax-exempt cloak, political dollars flow". The New York Times. ^ Overby, Peter (February 19, 2010). "Who's raising money for Tea Party movement?". NPR. ^ Carney, Eliza Newlin (December 18, 2010). "Tea Partiers put money where their mouths are". National Journal. ^ Zernike, Kate (February 5, 2010). "Convention is trying to harness Tea Party spirit". The New York Times. ^ a b Luo, Michael; Strom, Stephanie (September 20, 2010). "Donor names remain secret as rules shift". The New York Times. ^ Wertheimer, Fred (September 17, 2010). "Secret funds flow into races". Politico. ^ McIntire, Mike (September 29, 2010). "Senate Democrats press I.R.S. to review political spending by nonprofits". The New York Times. ^ "Baucus calls on IRS to investigate use of tax-exempt groups for political activity". U.S. Senate Finance Committee. September 29, 2010. Retrieved June 1, 2013. ^ Dennis, Steven T. (October 6, 2010). "Battle escalates over undisclosed campaign cash". Roll Call. ^ Lichtblau, Eric (October 6, 2010). "Republicans see political motive in I.R.S. audits". The New York Times. ^ a b Hicks, Josh (May 13, 2013). "Senate Democrats demanded stricter IRS standards for tax-exempt groups". The Washington Post. ^ "Welch leads 32 Democrats in effort to crack down on Wild West campaign atmosphere in post-Citizens United world". March 28, 2012. Retrieved June 2, 2013. ^ a b Mitchell, Corey; Stassen-Berger, Rachel (May 17, 2013). "2012 Franken letters asked IRS to investigate all social welfare groups engaged in "substantial" campaign activity". Star Tribune. ^ "Senators call for IRS investigations into potential abuse of tax-exempt status by organizations groups engaged in campaign activity". February 16, 2012. Retrieved June 2, 2013. ^ "Senate Democrats urge IRS to impose strict cap on political spending by nonprofit groups--vow legislation if agency doesn't act". March 12, 2012. Retrieved June 2, 2013. ^ Drawbaugh, Kevin; Dixon, Kim (May 13, 2013). "IRS kept shifting targets in tax-exempt group scrutiny: report". Reuters. ^ a b c Kocieniewski, David (January 11, 2012). "Budget cuts hamper the I.R.S. in efforts to collect billions in taxes, report says". The New York Times. ^ Ashley Killough (May 10, 2013). "Following tea party complaints, IRS admits 'mistakes'". CNN. Retrieved June 10, 2013. ^ a b Richard Rubin (June 24, 2013). "IRS Employees Used Terms Such as 'Progressive,' 'Israel'". bloomberg.com. Retrieved June 24, 2013. ^ "IRS Scandal Reaches Farther Than Just Cincinnati". Abcnews.go.com. Retrieved May 15, 2013. ^ "'Angry' Obama announces IRS leader's ouster in scandal". CNN.com. May 16, 2013. Retrieved May 21, 2013. ^ a b "IRS officials in Washington were involved in targeting of conservative groups". The Washington Post. Retrieved May 15, 2013. ^ a b Cohen, Micah (May 16, 2013). "I.R.S. approved dozens of Tea Party groups following Congressional scrutiny". The New York Times. ^ Korte, Gregory (May 15, 2013). "IRS approved liberal group while Tea Party in limbo". USA Today. Pompa, Frank; Schouten, Fredreka; Hargro, Tory (May 15, 2013). "IRS gave liberals a pass; Tea Party groups put on hold". ISA Today. Retrieved September 17, 2014. ^ "'Lookout List' Not Much Broader Than Originally Thought, Contrary to Reports". ^ Groups Targeted by I.R.S. Tested Rules on Politics, The New York Times, May 27, 2013. ^ Plait, Phil (May 11, 2013). "IRS Tea Party investigations: The Internal Revenue Service's targeted conservative groups. – Slate Magazine". Slate.com. Retrieved May 15, 2013. ^ "Weirdest IRS questions for Tea Party". ^ a b Moody, Chris (May 17, 2013). "IRS asked anti-abortion group about content of public prayers". Yahoo! News. Retrieved May 25, 2013. ^ Brejcha, Thomas; Breen, Peter; Wagenmaker, Sally (May 16, 2013). "Congress Receives Irrefutable Evidence of IRS Harassment of Pro-Life Organizations". Thomas More Society. Retrieved July 13, 2013. ^ a b "IRS reportedly grilled pro-life group about the 'content of their prayers'". Fox News. May 17, 2013. Retrieved May 20, 2013. ^ Limbaugh, Rush (May 17, 2013). "IRS Asked a Pro-Life Group About Its Prayers – But The Acting Commissioner Doesn't Think Any of This Stuff is Illegal!". Retrieved June 15, 2013. ^ "Lois Lerner's Brief and Awful Day on Capitol Hill". ^ "Why did the IRS target tea party petitioners as a group?". Washingtonpost.com. May 13, 2013. Retrieved May 14, 2013. ^ Obama Dismisses Benghazi Furor but Assails I.R.S., The New York Times, May 14, 2013. ^ "Obama: Alleged IRS political targeting 'outrageous'". CNN. May 14, 2013. ^ "Statement by the President". Whitehouse.gov. May 14, 2013. Retrieved May 21, 2013. ^ Weiner, Rachel (January 1, 1970). "Holder has ordered IRS investigation". Washingtonpost.com. Retrieved May 15, 2013. ^ Altman, Alex (May 14, 2013). "The Real IRS Scandal". Swampland.time.com. Retrieved May 14, 2013. ^ a b IRS watchdog takes turn in hot seat, challenged for keeping scandal from Congress, Fox News, May 23, 2013. ^ Becker, Bernie (June 25, 2013). "IG: Audit of IRS actions limited to Tea Party groups at GOP request". The Hill. Retrieved October 7, 2013. ^ a b "Final Response to Rep. Levin" (PDF). The Wall Street Journal. ^ Rubin, Richard (June 27, 2013). "Tea Party Groups More Likely to Get IRS Look Than Others". Bloomberg. Retrieved June 29, 2013. ^ a b Keith, Tamara (June 27, 2013). "Inspector General Changes Tune on Scandal". Retrieved June 29, 2013. ^ Bade, Rachael; French, Lauren (June 27, 2013). "IRS debate shifts again". Retrieved June 29, 2013. ^ Bedard, Paul (June 27, 2013). "Treasury: IRS targeted 292 Tea Party groups, just 6 progressive groups". Washington Examiner. The letter from the Treasury Department Inspector General for Tax Administration revealed that there just weren't many progressive groups who even sought special tax exempt status. A total of 20 sought it, and six were probed. All 292 Tea Party groups, meanwhile, were part of the IRS witchhunt. Condon, Stephanie (June 27, 2013). "IRS: Progressive groups flagged, but tea party bigger target". CBS News. Retrieved January 18, 2015. Parkinson, John; Phillip, Abby D. (June 27, 2013). "Watchdog Found IRS Softer on 'Progressives' Than Tea Partiers". ABC News. Retrieved January 18, 2015. Stein, Sam (June 27, 2013). "IRS Investigator: Tea Party Groups Were Scrutinized More Than Progressive Organizations". Huffington Post. Retrieved January 18, 2015. ^ a b c d e f Rothman, Noah (June 1, 2014). "All the President's Apologists". Commentary Magazine. ^ Parsons, Christi; Mascaro, Lisa (May 13, 2013). "Obama, lawmakers denounce IRS for targeting conservative groups". Los Angeles Times. ^ a b Strauss, Daniel (May 15, 2013). "Top Dem tax-writer Levin calls for IRS officials to resign (video)". Thehill.com. Retrieved May 21, 2013. ^ "John Cornyn Calls on IRS Commissioner Steven Miller to Resign". Kfyo.com. May 14, 2013. Retrieved May 21, 2013. ^ The Associated Press (May 15, 2013). "Sen. Hatch calls for IRS commissioner to resign". Heraldextra.com. Retrieved May 21, 2013. ^ O'Keefe, Ed (May 15, 2013). "Boehner on IRS scandal: 'Who's going to jail over this scandal?'". The Washington Post. ^ Friedman, Dan (May 15, 2013). "Obama announces acting IRS commissioner Steven Miller's ouster as White House works to contain scandal". Daily News. New York. ^ "Read the IRS acting commissioner's resignation letter". CNN.com (Political Ticker). May 15, 2013. ^ "Angry Obama announces IRS leader's ouster after conservatives targeted". CNN.com. May 15, 2013. ^ a b "IRS official Lois Lerner placed on administrative leave". CNN. May 23, 2013. ^ "Lois Lerner put on administrative leave by IRS". The Washington Post. ^ a b McKinnon, John D. (September 23, 2013). "Lois Lerner, at Center of IRS Investigation, Resigns". The Wall Street Journal. Retrieved September 23, 2013. ^ "Senator: 'Culture of Intimidation' at IRS Targeted Texas Conservatives". ^ Murray, Mark (June 4, 2013). "Poll: Obama standing remains steady after controversy". NBCNews.com. Retrieved June 5, 2013. ^ Marshall, Josh (May 13, 2013). "Taking Stock with Chuck Todd". Talking Points Memo. Retrieved July 10, 2014. ^ "The Vanishing I.R.S. Scandal". The New Yorker. June 25, 2013. Retrieved July 10, 2014. ^ Benen, Steve (August 20, 2013). "A 'nail in the coffin' of the IRS 'scandal'". MSNBC. Retrieved July 10, 2014. ^ Drum, Kevin (August 20, 2013). "Here's the Latest Fizzle in the IRS "Scandal"". Mother Jones. Retrieved July 10, 2014. ^ a b c Morgan, David; Dixon, Kim (June 9, 2013). "Republican IRS agent says Cincinnati began 'Tea Party' inquiries". Reuters. ^ a b Richard, Richard (August 5, 2015). "IRS Delinquent in Handling Tea Party Cases, Report Says". Bloomberg Politics. Retrieved August 8, 2015. ^ Hicks, Josh (May 16, 2013). "Steven Miller's resignation memo to IRS employees". The Washington Post. Retrieved May 24, 2013. ^ Fram, Alan (May 23, 2013). "IRS Replaces Official In Tea Party Controversy". NPR. Associated Press. Retrieved May 24, 2013. ^ USA Today, August 21, 2013,Democratic congressman sues IRS over political rules. ^ Kim Barker, Karl Rove's Dark Money Group Promised IRS It Would Spend 'Limited' Money on Elections. ProPublica (December 14, 2012). ^ a b Kevin Robillard, National Organization for Marriage to sue IRS, Politico (July 19, 2013). ^ a b David McAfee, Marriage Group Sues IRS Over Leaked Tax Return, Law360 (October 8, 2013). ^ a b c Mackenzie Weinger, IRS pays $50K in confidentiality suit, Politico (June 24, 2014). ^ Cochrane, Emily (October 26, 2017). "Justice Department Settles With Tea Party Groups After I.R.S. Scrutiny". The New York Times. Retrieved October 29, 2017. ^ Singman, Brooke (October 26, 2017). "Trump DOJ settles lawsuits over Tea Party targeting by Obama IRS". Fox News. ^ "Justice Department settles with conservative groups over IRS scrutiny". Reuters. October 26, 2017. Retrieved October 29, 2017. ^ Dinan, Stephen (October 26, 2017). "Justice Department admits IRS wrongdoing, agrees to $3.5 million settlement with tea party groups". The Washington Times. ^ a b McKinnon, John D.; Hughes, Siobhan (May 12, 2013). "Wider Problems Found at IRS". The Wall Street Journal. ^ Kocieniewski, David (October 10, 2012). "I.R.S. Commissioner Will Step Down in November". The New York Times. Retrieved October 17, 2012. ^ "Jordan to Miller re-transcribed Interviews" (PDF). Oversight.house.gov. Retrieved May 21, 2013. ^ Friedman, Dan (May 23, 2013). "Issa: IRS' Lerner Waived Fifth Amendment Right, Likely to be Recalled". Daily News. Retrieved May 23, 2013. ^ Barber, Ellison (May 23, 2013). "Waiving the Fifth". The Washington Free Beacon. Retrieved May 23, 2013. ^ Dershowitz: IRS official Lerner 'can be held in contempt' of Congress – The Hill's Blog Briefing Room. Thehill.com. Retrieved on July 19, 2013. ^ "Former IRS head "absolutely sure" he did not inform WH of targeting probe". CBS News. ^ "Shulman says he did not discuss IRS targeting during White House visits". ^ Milbank, Dana (May 22, 2013). "Former IRS official won't take responsibility". The Washington Post. ^ "A Frequent Visitor to the White House". ^ a b Associated Press (June 9, 2013). "IRS manager: White House not involved in reviews". NPR. ^ Blake, Aaron (June 9, 2013). "Elijah Cummings: 'case is solved' on IRS". The Washington Post. ^ O'Keefe, Ed (May 7, 2014). "House votes to hold Lois Lerner in contempt of Congress". The Washington Post. Retrieved July 28, 2014. ^ a b "Republicans hit IRS' Lois Lerner with contempt". POLITICO. May 7, 2014. Retrieved July 28, 2014. ^ Joachim, David S. (June 16, 2014). "I.R.S. Commissioner to Testify on Ex-Official's Lost Emails". The New York Times. Retrieved July 10, 2014. ^ "IRS says it's unable to recover subpoenaed Lerner e-mails in computer crash". CNN. June 14, 2014. Retrieved June 19, 2014. ^ Chambers, Francesca; Martosko, David (June 19, 2014). "The IRS THREW AWAY and recycled Lois Lerner's hard drive containing incriminating Tea Party targeting emails". Daily Mail. London. Archived from the original on June 20, 2014. ^ "The IRS's stunning and shameful record-keeping hypocrisy". The Week. June 18, 2014. Retrieved June 19, 2014. ^ a b "Did IRS Violate the Law on Lerner's Email?". The Fiscal Times. June 16, 2014. Retrieved June 19, 2014. ^ "Issa, Camp seek IRS hard drives". The Hill. June 19, 2014. Retrieved June 19, 2014. ^ Bade, Rachael (July 9, 2014). "Lois Lerner cautioned against email chatter amid lawmaker probes". Politico. Retrieved August 14, 2014. ^ Ohlemacher, Stephen (September 5, 2014). "IRS Says it has Lost Emails From 5 More Employees". Associated Press. Washington. Retrieved September 5, 2014. ^ Bade, Rachael (September 5, 2014). "More IRS employees lost emails". Politico. Retrieved September 5, 2014. ^ Korte, Gregory (September 5, 2014). "Senate subcommittee: No political bias in IRS targeting". USA Today. Retrieved September 6, 2014. ^ Drawbaugh, Kevin (September 5, 2014). "U.S. Senate investigators split on party lines over IRS scandal". Reuters. Retrieved September 6, 2014. ^ Hicks, Josh (September 5, 2014). "Senate panel hits auditor but clears IRS of bias in targeting scandal". The Washington Post. Retrieved September 6, 2014. ^ "Investigators into IRS scandal may have recovered lost Lois Lerner emails". Fox News. November 22, 2014. Retrieved November 24, 2014. Susan Ferrechio (November 22, 2014). "30,000 missing emails from IRS' Lerner recovered". Washington Examiner. Retrieved January 24, 2015. ^ Dinan, Stephen (December 23, 2014). "It's official: IRS employees biased against conservatives". Washington Times. Retrieved December 23, 2014. Diamond, Jeremy (December 23, 2014). "Issa's final IRS report spreads blame, slams 'culture of bias'". ^ a b Diamond, Jeremy (December 23, 2014). "Issa's final IRS report spreads blame, slams 'culture of bias'". CNN. Retrieved January 18, 2015. ^ Bade, Rachael (December 22, 2014). "Darrell Issa takes last stab at IRS for tea party affair". Politico. Retrieved December 23, 2014. ^ Joachim, David S. (December 23, 2014). "Inquiry Into I.R.S. Lapses Shows No Links to White House". New York Times. Retrieved December 23, 2014. ^ Bade, Rachael (January 20, 2015). "Repatriation? Not so fast—Letters galore bring bad news for IRS—Kasich proposes tax cuts". Politico. Retrieved January 31, 2015. ^ Bipartisan Investigative Report as Submitted by Chairman Hatch and Ranking Member Wyden, p. 6, from Senate Report 114-119, The Internal Revenue Service's Processing of 501(c)(3) and 501(c)(4) Applications for Tax-Exempt Status Submitted by "Political Advocacy" Organizations From 2010-2013 (August 2015). ^ Overby, Peter. "An Almost-Final Word On The IRS's Alleged Tea Party Targeting". NPR.org. ^ "Officials say no evidence criminal charges warranted so far in IRS targeting probe". Fox News Channel. January 13, 2014. Retrieved January 15, 2014. ^ "FBI doesn't plan charges over IRS scrutiny of Tea Party: WSJ". Reuters. January 13, 2014. Retrieved January 15, 2014. ^ Horwitz, Sari (October 23, 2015). No criminal charges will be filed against ex-IRS official Lois Lerner. The Washington Post. Retrieved: October 23, 2015. ^ "Justice Department: No criminal charges for Lerner, others in IRS scandal," Fox News, October 23, 2015, at . ^ "DOJ closes IRS investigation with no charges". CNN. October 23, 2015. Retrieved October 23, 2015. ^ "Justice Dept. : No criminal charges for ex-IRS official". Washingtonpost. October 23, 2015. Retrieved October 23, 2015. ^ Watson, Kathryn (September 8, 2017). "DOJ denies GOP request to reopen case against former IRS official Lois Lerner". CBS News. Retrieved September 22, 2017. ^ "Trump DOJ: No plans to charge Lois Lerner in IRS scandal, Fox News, Sept. 8, 2017, at . ^ McKelway, Doug (August 27, 2014). "IRS lawyer: Lois Lerner's BlackBerry deliberately destroyed after start of congressional probe". Fox News. Retrieved September 3, 2012. ^ Robbins, James S. (August 29, 2014). "'Fake' IRS scandal spawns real coverup: Column". USA Today. Gannett. Retrieved September 3, 2014. ^ Johnson, Eliana (August 28, 2014). "Lerner's BlackBerry: Is There a Scandal?". Retrieved September 6, 2014. Cassidy, John. "The Vanishing I.R.S. Scandal" The New Yorker. June 25, 2013. This page was last edited on 1 January 2019, at 11:58 (UTC).